Durham moved 23 points clear at the top of the County Championship after holding their nerve to beat Lancashire by five wickets at Aigburth. The top two began the third day with the match finely poised, leaders Durham resuming on 27-3 chasing 181 to win. Second-placed Lancashire seemed to have set up a tight finish when they reduced Durham to 101-5 just before lunch. But Dale Benkenstein (60no) and Ian Blackwell (26no) guided them to victory with an unbroken stand of 81. 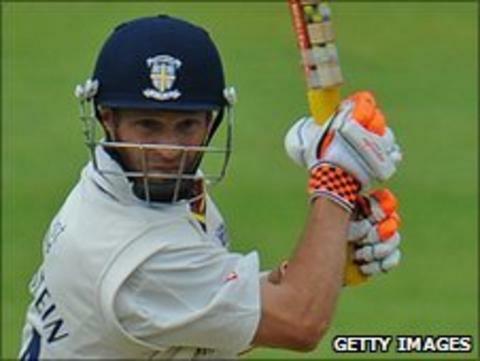 Benkenstein's second unbeaten half-century of the game helped him pass 1,000 Championship runs this season and followed his invaluable 83 not out in Durham's first innings 186. That effort, part of a ninth-wicket stand of 79 with Graham Onions, went a long way to giving them a 102-run first innings lead after Lancashire had been bowled out for 84 after being asked to bat. That advantage ultimately proved decisive as Durham ground their way to their target to complete the double over their nearest title challengers. Paul Collingwood and Will Smith began the day tasked with setting Durham on their way and they obliged with a stand of 58 for the fourth wicket. Collingwood enjoyed some good fortune when he was dropped on 21 by Paul Horton off Kyle Hogg and reached 45 before falling to a stunning catch at third slip by Steven Croft off Luke Procter's second ball, shortly after a 10-minute rain delay. Gary Keedy then trapped Smith (30) leg before to give Lancashire hope. But they missed their chance when Hogg dropped Blackwell at long-leg with the score 123-5, with the former Somerset man helping Benkenstein see Durham to their target. Lancashire's one saving grace is that they have a game in hand on Durham, meaning victory in that will put them back in the thick of the title hunt. "To have won by five wickets looks like it was fairly easy, but everyone watching knows it was on a knife-edge pretty much throughout the whole game, so it was a massive win for us. "We were up for it and we knew we had been batting well down the order so we were confident we had the batting to do it, but doing it under pressure was the key. "After last year we weren't firing on all cylinders and I think there were a lot of questions in a lot of areas and I think we've set out to answer those and put them right." "I'm obviously disappointed, but I'm pretty proud about the way we attacked them today. "Obviously the first day hurt us a lot, but that allowed us to bowl in the same conditions and Durham found it difficult as well. "We're still right in the hunt and if we continue playing like we're playing we're going to get some good results going into the second half of the season."